The US still supports the Kosovo project even though it has failed and brought great instability to the region making many Kosovan extremists join ISIS and come back now to destabilize nearby Macedonia, says International affairs commentator Marko Gasic. Anti-government protests are back on the streets of Macedonia’s capital, Skopje. They follow armed clashes in the ethnically mixed city of Kumanovo that erupted on Saturday and left 22 dead, including eight police officers. Demonstrators accuse officials of trying to cover up the killing of a young man by police in 2011, and demand the government’s resignation after opposition figures released the latest in a series of leaked recordings, implicating the government in lying to the public. 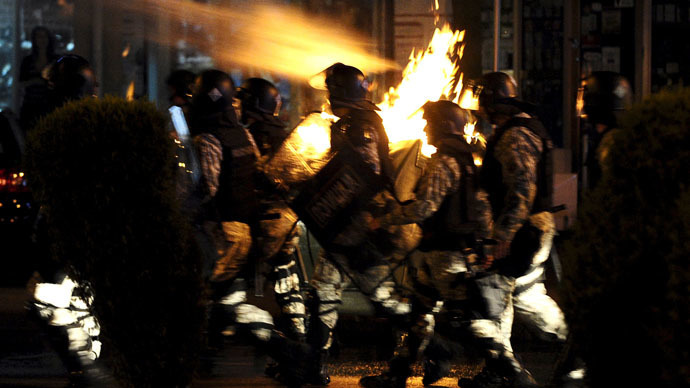 RT:The American embassy in Skopje and some EU diplomats are criticizing the Macedonian government for failing to address the root causes of the riots in the capital. What are the root causes and what does this say about the pressure being put on Macedonia by Western governments? Marko Gasic: I think the root causes are actually closer to Washington than to Skopje in my opinion because when a red light goes on, whenever I hear the Americans criticizing a government and demanding they take action to address supposedly legitimate grievances - of course the grievances of corruption are Balkan-wide, endemic in the region, it’s nothing new there - but as in Ukraine, as in Yugoslavia in 1999, and now in Macedonia, American pressure always is self-serving and it’s designed to achieve an American end. And I think that the larger question here is the problem for the US is the planned pipeline which is designed to go from Turkey into Central Europe through Greece and indeed through Macedonia. The US has created a very effective cordon sanitaire to block off Russia from its natural EU economic partners. But this cordon sanitaire is frayed at the edges with the Turks not playing ball, with the Greeks being unreliable. So the US needs a plan B. And if it needs to shut this pipeline off then it will do it if it has to in Macedonia. And how better to do that than to create a great deal of instability to make Russia and the EU think twice about the idea of building a pipeline there. RT:So you think the instability we are seeing here is directly linked to the pipeline. MG: I do yeah because the question is why now. Extremist Albanians - who want to create a greater Albania out of sovereign countries - have been a problem for the region… for quite a long time and usually the US supports them, I don’t see them behaving any differently now. But the question is why is this unrest happening now? The corruption is a historic problem for Macedonia and for the region, but what is new is the Turkish Stream pipeline that President Putin has planned to replace South Stream which was cancelled. Now this is the problem for the US because if that pipeline goes through, then the US pipeline which it would like to have via Qatar sending gas into Europe and allowing the US to press the stop button on energy supplies into the EU when it likes. That’s the thing that would be sacrificed, and the US doesn’t want to see that lever of power removed by Russian advancement. Also the US doesn’t want to see Russia and the EU relations at a good cooperative level. And of course the alternative to those relations is that the EU will have to turn west towards the US, towards its own liquefied natural gas supplies and indeed towards US allies in the Middle East, which effectively will give the US a veto on the development of Russian and the EU relations throughout the region. RT:The shootout this weekend was allegedly carried out by a group led by Kosovan Albanians. The West supported the minority when Kosovo broke away from Serbia, is the support still there? MG: Yes it is. The Kosovan Albanians were already the US lever into the Balkans because they were the basis for Camp Bondsteel, the largest military base since Vietnam which is very close to Macedonia. We can see now why the Americans would have wanted to build such an important military base very close to this strategic route which links Central Europe to the Middle East via the Mediterranean. So yes, the US still supports the Kosovo project even though it has undeniably failed and even though it has a huge amount of instability in Kosovo caused by the endemic corruption which has led many Kosovan extremists to go to join ISIS in the Middle East, and to come back now to destabilize nearby Macedonia. In essence whether it’s ISIS or Albanian extremists in the Balkans, the US supports them because they do what the US wants when the US wants it, and that is now in Macedonia.